A solid pump-action blaster that's long overdue. 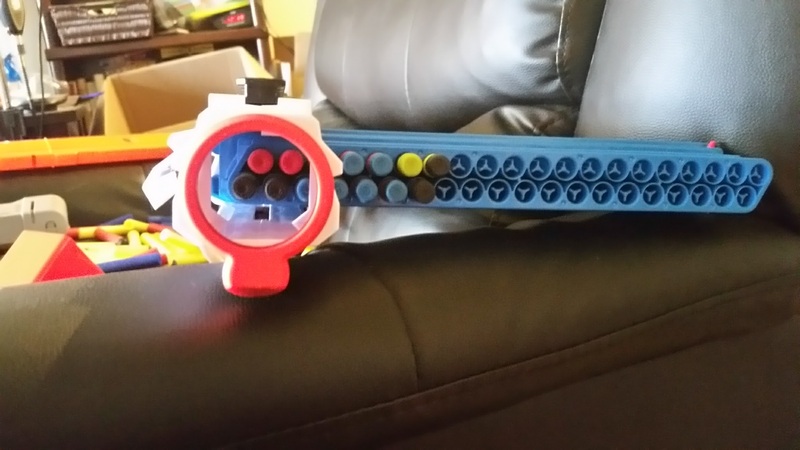 Back in July, Mattel made a splash with a prototype, pump-action Boomco blaster. 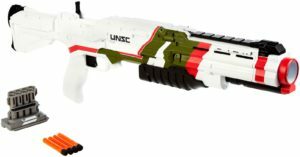 Modeled after the “Blaze of Glory” unlockable weapon in Halo 5, it gave hope to Boomco fans for the line’s survival. Now, after arriving at ToysRUs, it’s in our hands. 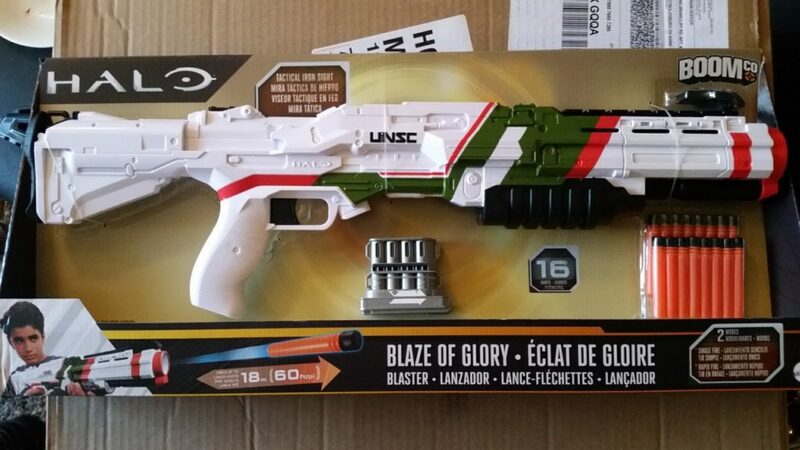 The Blaze of Glory is surprisingly light, with colors and detailed molding on both sides of the blaster. Automatically, that beats Hasbro as of recent, with their lack of detail on the non-display side of the shell. The blaster is as long as the Rapid Madness, but with the handle farther back and the clip in front. It comes with an eight dart clip and sixteen darts, and claims 60′ ranges on the box. A bit disappointing, considering the ToysRUs website listed 70′ as of this posting. 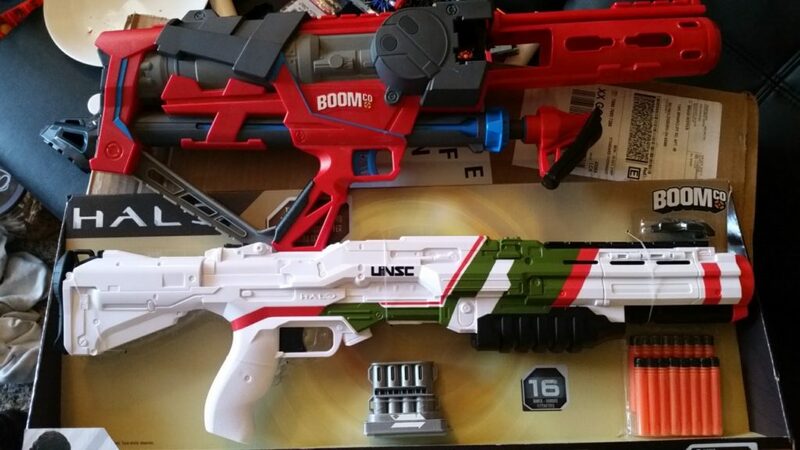 The handle is surprisingly large for a dart blaster, a nod to the fact that not all Halo fans are young kids. In addition, the pump grip is nicely textured and easy to slide back and forth. This area also features an interesting choice in design v. engineering. That entire area of the shell has detailed molding, so the grip rides on four plastic rollers. This allows for smooth action without wearing into the shell. They’re also very small, and are easy to knock loose if you choose to open up the blaster. Be very careful. The Blaze of Glory, as a pump action blaster, led to the design of a sled mechanism for priming the blaster. There’s only ~1.5″ of draw on the blaster, and ~.96″ of diameter on the plunger head. As such, a decently strong spring is a must for ranges. 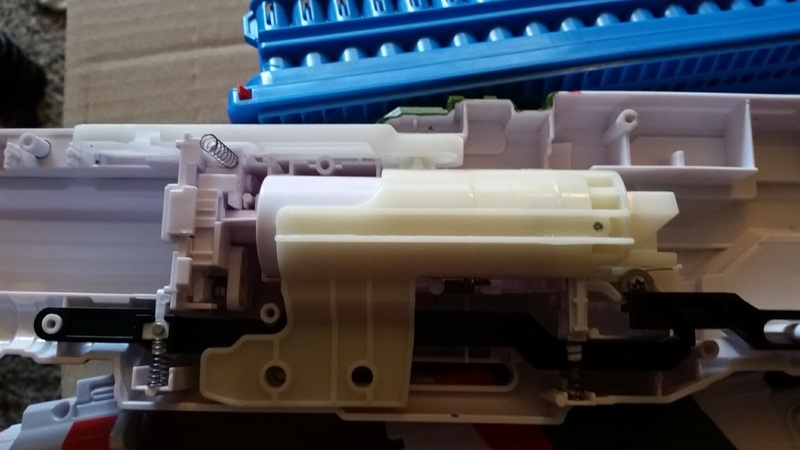 The priming sled also has a mount for the blaster’s slam-fire mechanism. An extra lever is placed between the trigger and the catch, and it moves out of place when the blaster is being primed. Upon completing the motion, the lever is tilted by a depressed trigger, releasing the plunger. The clip advancing mechanism resets the ratchet on the pull back, and moves the clip on the forward motion. The picture of the internals is only part of the picture, however. Due to the desire to make an accurate scale model of the in-game weapon, the clip and plunger sit all the way forward. This leaves a massive amount of empty space in the shell. Feel free to integrate whatever gizmos you so desire. Like the MA5 Assault Rifle, a flap on the right side opens up as the clip advances through its slot. Internally, the plunger assembly is held together with metal pins. This makes upgrading the spring a trial in patience, if you’re even able to get the rear pin loose. Seeing as a spring replacement would not be quickly possible, I opted for a spring spacer. After cutting a slot into a 5/8″ length of 3/4 PEX, I pried the plastic open enough to slide over the plunger rod, then pressed the ends together. It sits perfectly inside the plunger tube’s back plate. 3/4 CPVC could also be used. 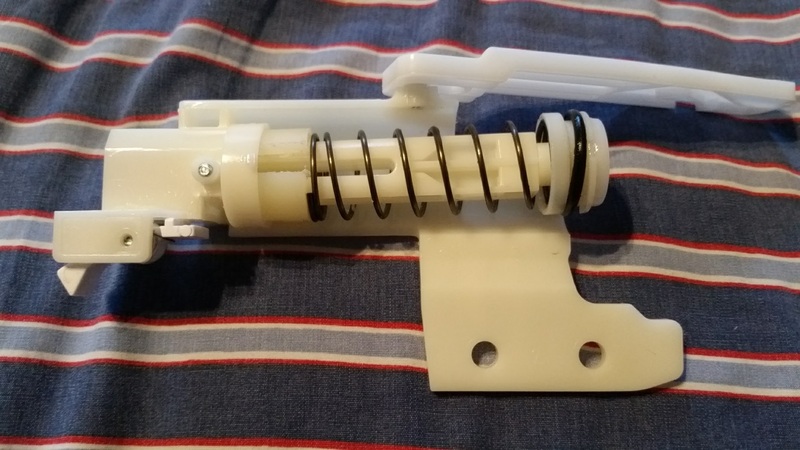 Even with the spacer, the blaster does not reach full compression. Any more work, however, will wait for an extended use in HvZ and a reopening to spot any stress points in the plastic. Boomco darts perform somewhat differently from foam darts. They have a smaller diameter, but also weigh 40% more than standard Nerf Elite darts. That, plus their weight distribution, equals a dart that maintains velocity while being very accurate. The Blaze of Glory, when completely stock, averaged 50 feet per second (fps). It sounds low, but the improved flight means that angled ranges were (in this case) 62′ on average. With sniper clips (clips with the vent holes filled in to provide a more complete barrel), velocities increased to 60fps. With the spring spacer in place, normal clips averaged 62fps, while sniper clips averaged 71fps. This is nearly on par with the stock Flipbow I regularly use for Humans v Zombies games. Note that while it appears awkward, using 40-dart clips is a breeze. Due to the large handle and hand placement, you exert more than enough torque to counter any overhanging weight in the front. 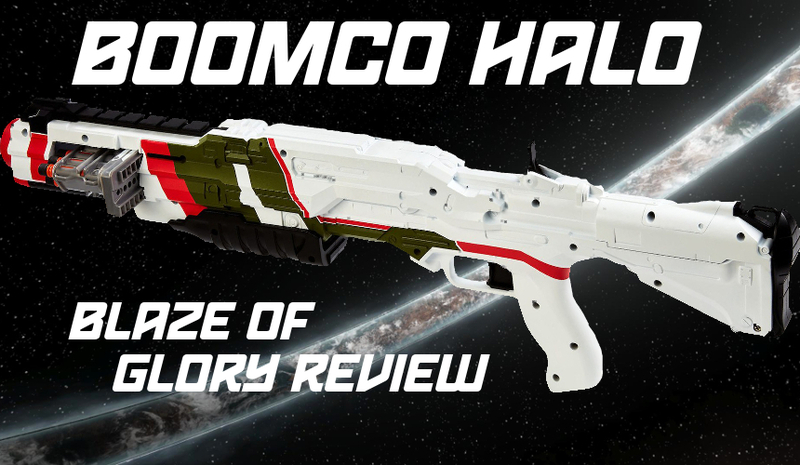 At $40, the Blaze of Glory is a solid entry into the Boomco line, and a long-needed pump action blaster. Stock ranges are slightly disappointing compared to most current foam blasters, but the ammo accuracy somewhat makes up for the range. The rate of fire is vastly improved thanks to the slam-fire, and the possibility of spring replacement makes for a formidable Humans v Zombies primary, as well as some wars. It’s also a well-made replica. Should you get one? Depends if you use Boomco, or are a serious Halo fan. I bought two, if that tells you anything! 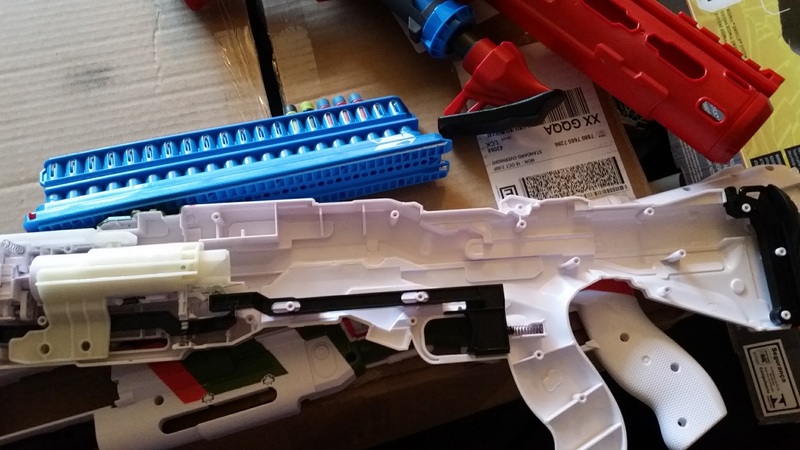 This entry was posted in Dart Blasters, Modifications, Reviews and tagged 2017, boomco, Halo, mattel, review on October 16, 2017 by BuffdaddyNerf. Excellent review. I definitely will be getting one of these to go with my needler. Question, I’m assuming it doesn’t, but does it fire more than one dart at a time? Your assumption is correct. It may be modeled on a video game shotgun, but it’s definitely one dart at a time. Toys R Us says it has two fire modes: single and quick fire mode. I assume that means slam-fire, so I do not believe it fires two darts at once. I can confirm that it has only a single shot firing mode. However, 4 darts per second from a stock SPRINGER (normal rapidstrike doesn’t achieve that ROF) is quite formidable. Awesome review. I’m required by ethics and common sense to remind folks that modifying your boomco blaster will invalidate the warranty and could be dangerous. IDK if the warranty is worth anything anymore, it seems as if boomco is dead. On their website all of their blasters, ammo and accessories cost 0 Dollars each. And 40-round clips sell on eBay for 20-300 Dollars brand new.